U.S. Names Junior Camp Roster - College Hockey, Inc.
Seventeen schools represented among 33 NCAA players invited. 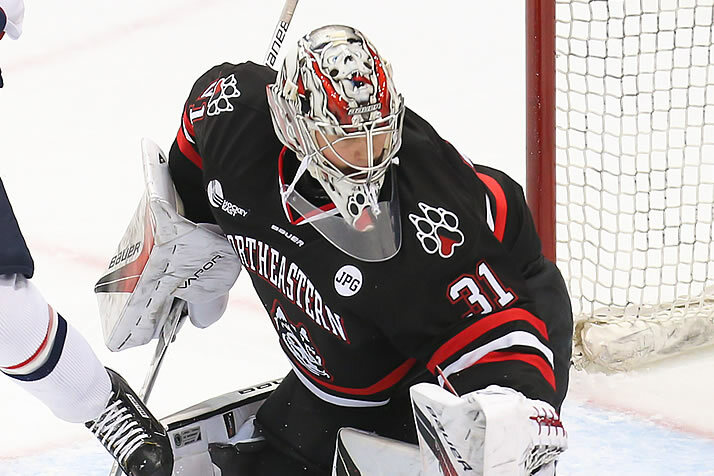 Cayden Primeau earned first-team All-Hockey East honors as a freshman in 2017-18. The 2018 World Junior Summer Showcase will feature 33 NCAA players or recruits on the United States rosters, USA Hockey announced Friday. Nearly one-third of all Division I programs will be represented on the U.S. roster, with 17 schools boasting at least one player or recruit at the event, which serves as an audition for the 2019 U.S. National Junior Team. Boston University leads all schools with five players or recruits invited, followed by Minnesota Duluth (four), Boston College (three) and Wisconsin (three). Six players – Mikey Anderson, Quinn Hughes, Josh Norris, Ryan Poehling, Dylan Samberg and Brady Tkachuk – return from the 2018 U.S. National Junior Team that captured the bronze medal at the World Junior Championship. All six played NCAA hockey last season. The 2018 World Junior Summer Showcase will take place July 28-Aug. 4 in Kamloops, B.C., and will feature teams from Canada, Finland, Sweden and the U.S.
Minnesota State head coach Mike Hastings is the head coach of the 2019 U.S. National Junior Team, with assistance from Dartmouth associate coach David Lassonde, Ohio State associate coach Steve Miller and Minnesota Duluth head coach Scott Sandelin. Clarkson alum Chris Clark and Michigan Tech alum Pat Mikesch will serve as guest coaches at the camp.